Dr. Michael Loui says that all professions have codes of conduct. “Avoiding injury to others by false and malicious action” evidently doesn’t necessarily mean avoiding injury to others by true or benevolent actions, if you can picture that. The two professional societies that civil engineers are most often associated with are the National Society of Professional Engineers and the American Society of Civil Engineers and each publish their own codes of ethics. Comparing the fundamental canons of each reveals that they are very similar, but not uniform. The National Society of Professional Engineers is the oldest of the ethical codes, and focused on licensed engineers. 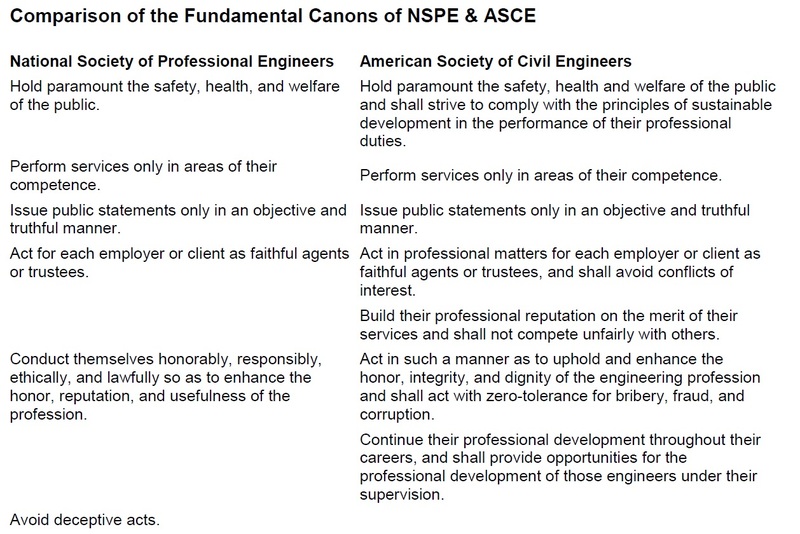 Because most licensed professional engineers are civil engineers, it seems sensible that the NSPE and ASCE codes should contain several similar provisions. Both codes emphasize the importance of putting prioritizing public safety ahead of all other interests, which is consistent with an understanding of civil engineering as being in the service of civil society. Notice in this clip that the hero argues that the needs of the public supersede private interests. His wife’s rejoinder redefines the term “greater good” from a moral calculation that calls for individual sacrifice to a selfish optimization of personal utility. The clip exemplifies the conflict that can exist for engineers working in business organizations. One notable difference between NSPE and ASCE is the treatment of sustainability. In the NSPE code, “sustainable development” is listed as a “professional obligation”, rather than a fundamental canon. The ASCE code elevates the visibility of the “principles of sustainable development” by listing them as a fundamental canon. Professional codes of ethics (or conduct) are typically preoccupied with the duties or obligations of those belonging to the profession, which is called a deontological approach. They list rules of behavior to which professionals are expected to conform. Such rules are enacted to achieve predictable results as well as to provide a clear account of what behavior is considered ethical or correct in various circumstances. However, lists of rules are difficult to apply toward the broad systematic lens through which sustainability challenges are viewed. Sustainability problems can be unfamiliar, high-risk with highly unpredictable outcomes. In fact, the most difficult moral problems are those that exist outside the rules, were never anticipated by the rules, or require the professionals to exercise judgement with regard to violating the rules. To effectively operate under these uncertain and unanticipated conditions, future engineers and scientists need to be able to handle surprising situations and be equipped to evaluate appropriate action where conflicting interests are at stake. In this video, Dr. Loui explains consequentialist (a/k/a utilitarian) and deontological approaches. One recent example of consequentialist reasoning is the US Army Corp of Engineers (USACE) decision in Spring 2011 to intentionally destroy levees protecting Missouri from record water flows in the Mississippi River. When water levels on the Ohio river were projected to exceed 61 feet above flood stage at the Cairo, Illinois river gauge, the Corp ordered the detonation of explosives that would intentionally flood farms in the Birds Point-New Madrid Floodway, but spare Cairo from sure destruction. 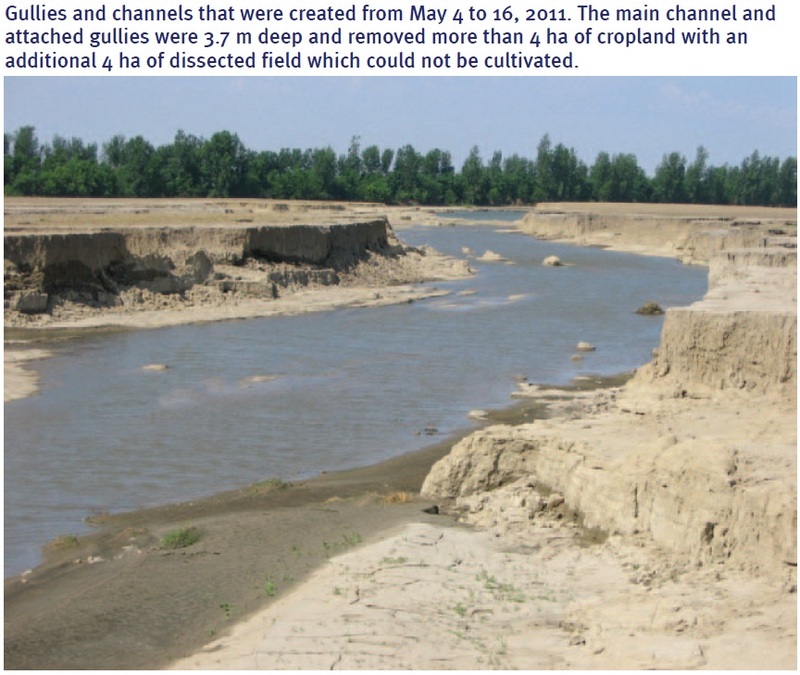 The induced breach and flooding of the 53,824 ha of Missouri farmland resulted in the loss of 2011 crops (i.e., wheat, corn and soybeans) and caused damage to future soil productivity. While the floodway was originally constructed in 1928, it had never been activated until 2008, despite earlier extreme flood events. Taken in isolation, the floodway decision faced by the USACE in 2011 has elements of the classic consequentialist thought experiment known as the “Trolley Problem” (http://en.wikipedia.org/wiki/Trolley_problem). However, the channelization and levee construction enacted by the USACE that was intended to protect communities may have perversely increased systemic flood risks. To the extent that the Mississippi River system acts as a complex system, the consequences of any single engineering action may be unpredictable and uncontrollable – i.e., resulting from hidden or multiple, interdependent causes – that undermine consequentialist reasoning. It is therefore imperative that students preparing for sustainability-related careers possess moral reasoning capabilities that are adaptive to unfamiliar and unexpected situations. Photo from Olson KR, Morton LW. 2012. The impacts of 2011 induced levee breaches on agricultural lands of Mississippi River Valley. J. Soil & Water Conservation. 67(1):5A-10A. Copyright 2012 by the Soil & Water Conservation Society. Moral theories provide bases for reasoning through problems that are not reducible to prior deontological prescriptions. However, these theories may be in conflict. For example, a professor may feel that deontological reasoning requires assigning a failing grade to a student that missed a significant assignment, in accordance with the rules in the posted syllabus. Alternatively, the professor may feel that the consequences of a failing grade for this student are disproportionate, considering that the student only missed the assignment because they were participating in an extracurricular professional development event, such as an academic competition, conference, or Engineers Without Borders project. In this case, the professor might elect to excuse the student from the missed assignments, by asserting a consequentialist argument. One view that Dr. Loui neglects to explain is called virtue theory. In this approach, ethics is a matter of aspiring to embody virtues such as honesty, generosity, or integrity. These virtues can be in conflict with consequentialist theories — for example, in telling white lies for the sake of sparing the feelings of a friend. In this last video, Dr. Loui explores a special application of professional ethics important to most Universities, and probably all engineering faculty: research ethics. Most research active faculty belong to one or more professional societies, although they may not be professional engineering societies. Many (but not all) researchers receive some minimal training in research ethics, but practices (such as order of authors) vary between disciplines. One of the most accessible on-line resources to learn more about moral philosophy is found here: http://www.iep.utm.edu/kantmeta/. More information on ethics in research and educational settings in particular can be found at http;//www.nationalethicscenter.org. This entry was posted in Uncategorized on February 19, 2014 by making7. I did not realize how much room for interpretation and situational circumstances there are in engineering ethics. Even in the table of the comparisons between the fundamental canons of NSPE and ASCE outlines how vague the standards truly are. Overall, an engineering must follow the ethic outlines but most importantly but beyond oneself and use ones knowledge to benefit society as a whole.